We shipped out from Edmonton on Monday, June 18. At that point, I realized I forgot the excellent Alaskan Highway guidebook 'The Milepost' in my top desk drawer. Luckily, I read the chapter on the Alcan in its entirety and made notes, which I also forgot. Thank god for the internet...which is virtually non-existent on the Alaska Highway. Meanwhile, Dave was pumping the tires of our new 'joint' Instagram account: @dananddavedrivealaska. This would not last long. 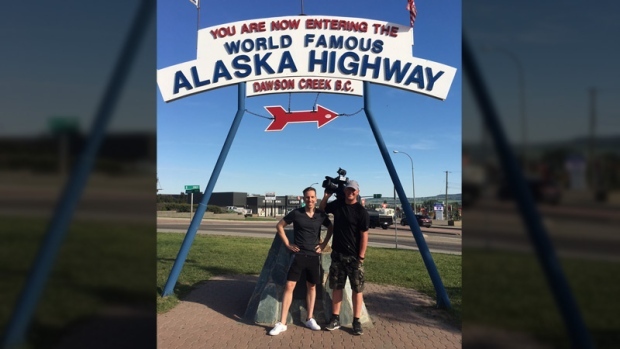 We drove just past Hinton, AB to the famous 'Scenic Route to Alaska' sign that you see on your way into Jasper. Yes, the band named itself after that sign. We're in the process of finding out if the band will lend their tunes for our feature! We then followed Highway 40 through Grande Cache, Grande Prairie, and ultimately, to Dawson Creek or 'Mile 0'. DC is the official start of the Alaska Highway. We drove into town at about 18:30 PT and almost instantly found the tourist stop commemorating 'Mile 0'. It was dead. WAIT! We spot a large travel van. Inside were a husband and wife who turned out to be Jim and Maureen Capone from New Jersey. They were on their way to Alaska, a drive they say they've always wanted to do since retiring from teaching. We chatted with the Capone’s and then they left. But then came a motorcyclist from Ponoka. Then a couple from Virginia. Then a large truck from Texas. A couple of cars from California. All of a sudden, people were coming out of nowhere. Car by van by RV. Back to back to back. We chatted with people. Took photos of each other. Shared a few laughs. It was in these moments we got a true sense of the anticipation and excitement people had for the long journey ahead. Then, after about 45 minutes, it was dead. Actually. We mused that if we had stopped for dinner or lunch somewhere along the way, we would've missed it all. (Note: In the media, we occasionally reference the fictional 'news gods' when timely or coincidental events happen to us, good or bad. The news gods smiled upon us on Day 1). Meanwhile, Dave is unable to log into the new Instagram account. He consults a milennial-aged server at the restaurant to figure out why he's logged out. Long story short: We can't get back into that account. We stayed the night in Dawson Creek.